In our last episode, we dug into some of the stats on Washington school districts. We found that 79% all Washington districts have just one high school. 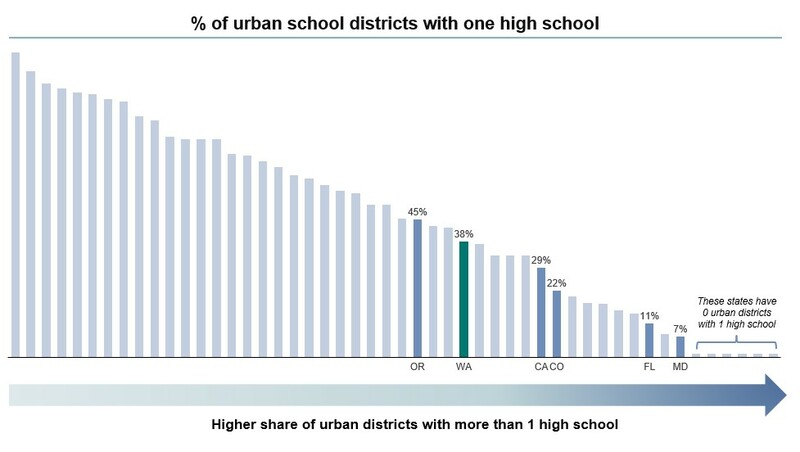 Of districts in urban areas, 38% have only one high school (see “urban” definition at the end of this post). In multiple instances these solo high schools are within a short drive of high schools in neighboring districts. When looking at national data, Washington is in the middle-of the pack (#21) for percent of urban schools with one high school. Our takeaway: urban, single high school districts are not a phenomenon isolated to Washington. Maryland and Florida stood out for their low share of single high school districts (7% and 11%, respectively). Our hunch: when district borders align with county borders (as is the case for MD, FL, and other states) districts can achieve greater scale… to be further analyzed another time! Should there be fewer single-high school districts? Both nationally and in Washington, there was a significant wave of school district consolidation during the middle part of the 1900s as our nation moved away from the “one-room schoolhouse” towards the elementary /middle / high school model that exists today. As recently as 2009, former Washington Governor Gregoire requested that Washington’s state superintendent (OSPI) should make recommendations for further consolidation. All this to say, consolidations are still an often-discussed topic. As mentioned in part I, there are can be benefits to larger school districts and consolidation including more specialized course offerings, lower administrative costs, and potential reductions in cross-district inequities. However, the actual work of consolidation – both political and logistical – can be a big barrier. District consolidation involves significant efforts to convince voters, teachers, union members, and students that a merger is the right way to go – just ask Vermont and New York. There is also a substantial amount of logistical legwork involved to plan and execute a merger (e.g. facilities changes, employee and payroll integration, revised student policies, new transportation routes, etc. ), which can stretch over multiple years and cost millions of dollars. Just because consolidations are hard and politically-fraught, doesn’t mean districts shouldn’t pursue them. But there are other ways to realize the scale benefits of larger districts without the challenges of consolidation – namely through partnerships with regional networks and intermediaries. Washington already has a system of 9 regional networks, known as Educational Service Districts (ESDs). These state-funded organizations shoulder some of the back-office, administrative, and professional development burden on behalf of school districts. So what does it all mean? We see an opportunity for individual school districts, and states more broadly, to re-evaluate current district boundaries to ensure students and tax payers are well-served by high quality and efficient education systems. In some cases, consolidation may be the best option, in other cases regional networks and intermediaries can help small districts achieve scale and avoid the pain of mergers. Data sources: ERDC; 2015 , NCES ELSI Database; 2016-2017. Methods: To determine the number of high schools in a district we looked at all schools with students enrolled in 12th grade. We then excluded alternative, charter, and virtual schools as defined by the Department of Education NCES database. We also excluded juvenile detention centers, community colleges, educational services districts, and schools with fewer than 10 high school students enrolled. To define “urban” districts, we used the NCES classification and included all cities and large / midsize suburbs.